Under near perfect autumn skies, with leaves falling throughout the beautiful course, Kenya’s Geoffrey Mutai scored a decisive victory in the New York City Marathon on Sunday, crossing the finish line unchallenged in two hours, eight minutes, and 24 seconds. 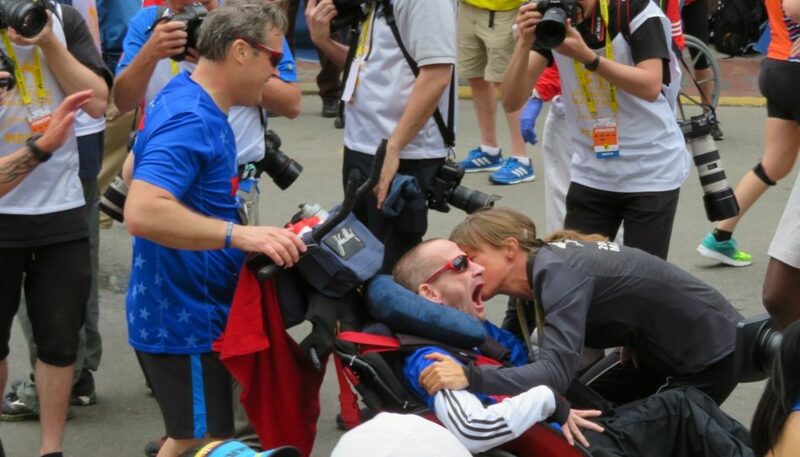 It was his second win in three years in the world’s biggest 26.2-mile race, that had to be canceled last year in the tragic aftermath of Hurricane Sandy. 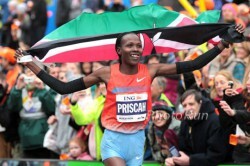 And in the women’s event, Priscah Jeptoo, also from Kenya, prevailed in 2:25:07, a win made even more significant because it also clinched for her the 2012-2013 World Marathon Majors Series championship. 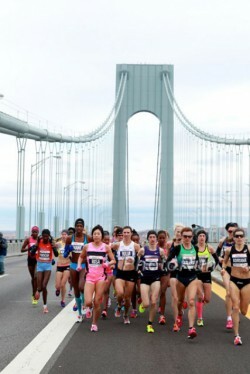 A record 50,000-plus runners took part on this windy day, and the start, in front of the Verrazano-Narrows Bridge on Staten Island, was boisterous and celebratory given the fact that the marathon was once again “on” in New York City. 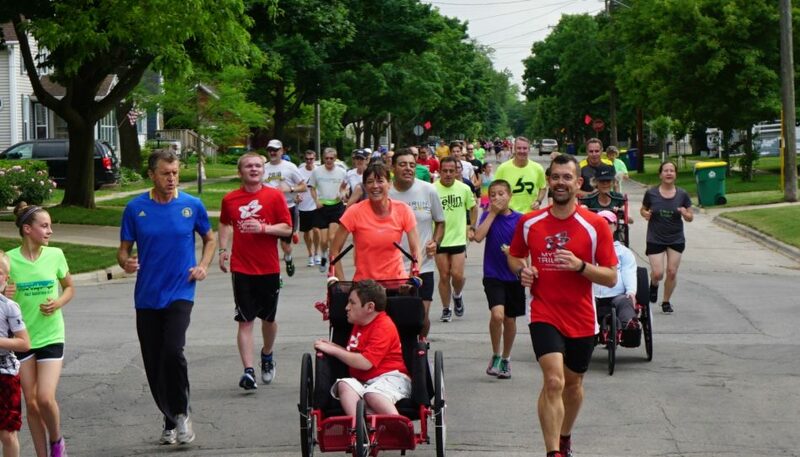 In a significant milestone, among this year’s runners was the one-millionth starter since the race began. Included was a small group of five special participants—Haitian marathoners who were sponsored to run thanks to the support of the J/P Haitian Relief Organization, a nonprofit started by actor Sean Penn to assist the poor Caribbean nation after the destruction wrought by a terrible earthquake in 2010. Geoffrey Mutai’s “Big Apple” win proved to be anything but easy. From the start, the pace was not as fast as expected, with a 20-strong group coming through the halfway point in a relatively pedestrian 1:05:06. 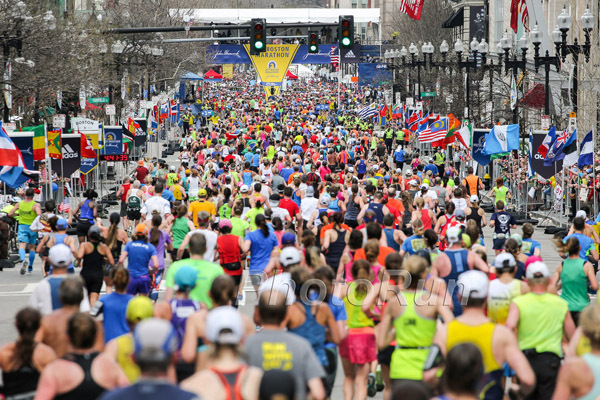 Geoffrey Mutai, who ran the fastest unofficial marathon in history at the 2011 edition of the Boston Marathon—a wind-aided 2:03:02—did most of the leading, with Ethiopian rival Tsegaye Kebede with him at the front of the leading group. It was not until late in the race that the big move came. Just after the 21-mile point, when the runners were heading down Fifth Avenue on their way to Central Park, Geoffrey Mutai finally made his surge and the only person to answer his challenge was fellow Kenyan Stanley Biwott. The East African duo ran alongside each other through beautiful Central Park on their way towards the finish line—but in the 23rd mile Geoffrey broke clear and Stanley quickly faded. The 32-year-old winner maintained his pace all the way to the finish—but later admitted that the race was anything but easy, thanks to the challenging conditions. “Today it was a very tough race,” he said afterwards. “The first time here is easy. To defend your title is not easy. Today it was a very tough wind.” After the hard-fought struggle, the father-of-two was elated—not least because victory made him only the sixth man in the history of the race to defend his crown. And he said he found extra happiness in the fact that it was his manager Gerard Van de Veen’s birthday. 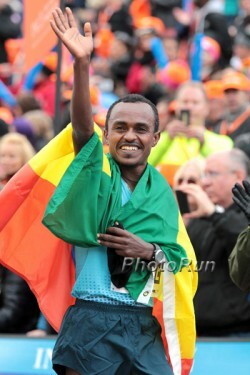 In second place was Tsegaye Kebede of Ethiopia, who cruised in to the finish less than a minute behind Geoffrey Mutai, crossing the line in 2:09:16. 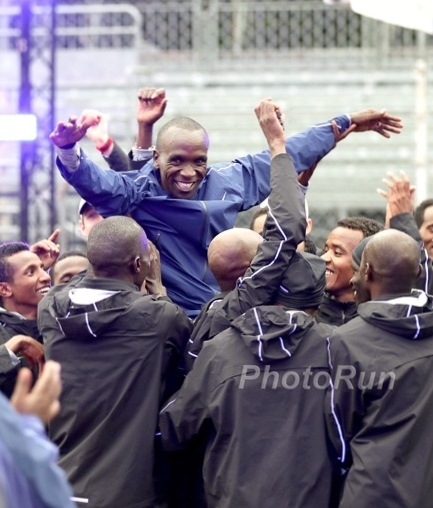 The runner-up place was enough to seal his triumph as the 2012-2013 World Marathon Majors Series victor. Third place in the men’s division went to Lusapho April of South Africa who came across the famous Central Park finish line in 2:09:45. Stanley Biwott took fifth (2:10:41). Runners from the United States were not as well represented as they were in 2009 when Olympic silver medalist Meb Keflezighi won the race outright. 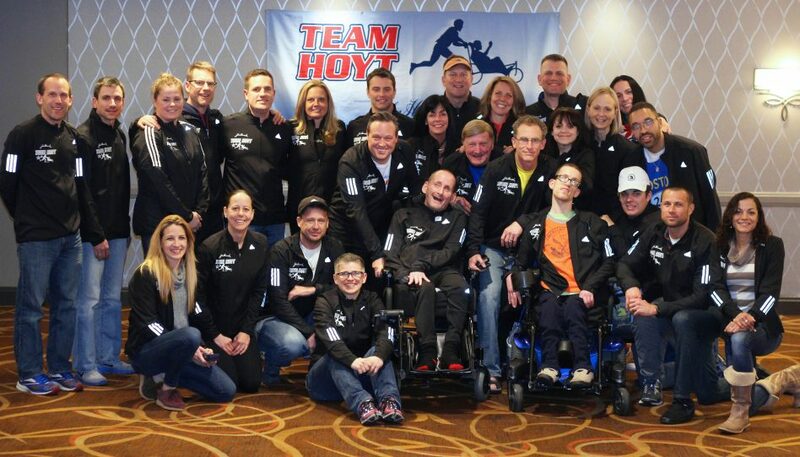 It was left to Ryan Vail to take top American honors with a 13th place showing. Meanwhile in the women’s race, Kenya’s Priscah Jeptoo executed a brilliant strategy that ended up working out for the 29-year-old runner. 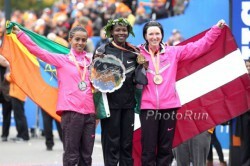 From the start, Buzunesh Deba and Tigist Tufa, Ethiopian citizens who live in New York City, went out at a blistering pace, while Priscah Jeptoo chose to hold back and conserve her energy. The duo of Buzunesh Deba and Tigist Tufa passed the 10-kilometer mark in 34:44 minutes and they were still in the lead at the 10-mile mark (55:18) and through to the half (1:12:38). By that point, Priscah Jeptoo and the chase group were more than three minutes behind—light years in marathoning! However, the dynamic changed along the Queensboro Bridge at the 25K mark, when Priscah found out that she was so far behind the leaders. She immediately began to increase the pace. Slowly but surely—and all alone—Priscah began reeling in the leaders. For three miles, she ran at a much quicker pace than Buzunesh Deba and Tigist Tufa—and with just 2.5 miles remaining she seized the lead. Buzunesh Deba, who had repeatedly looked behind her and knew Priscah was coming, tried to counter her rival’s move, but it was too late. Priscah wound her way through the remaining scenic miles in Central Park unchallenged and broke the tape in 2:25:07. Despite her obvious fatigue, Buzunesh Deba came through next in 2:25:56. Third place went to Latvia’s Jelena Prokopcuka (2:27:47). The first American woman to finish was Adriana Nelson (2:35:05)—good for 13th place. Germany’s Sabrina Mockenhaupt finished 7th with a time of 2:29:10.